The Duke of Milan Francesco I Sforza ordered construction of a Dominican convent and a church at the site of a prior chapel dedicated to the Marian devotion of St Mary of the Graces. The main architect, Guiniforte Solari, designed the convent, which was completed by 1469. Construction of the church took decades. Duke Ludovico Sforza decided to have the church serve as the Sforza family burial site, and rebuilt the cloister and the apse, both completed after 1490. Ludovico's wife Beatrice was buried in the church in 1497. 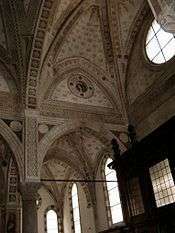 The design of the apse of the church has been attributed to Donato Bramante, who at the time was in the service of the Duchy; however, there is scant documentary evidence links Bramante to this church. His name is inscribed in a piece of marble in the church vaults delivered in 1494. 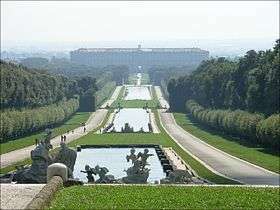 Some documents though mention the name Amadeo, likely Giovanni Antonio Amadeo. Similarities between this church and Amadeo's design for Santa Maria alla Fontana make this attribution more likely. In 1543, the Titian altarpiece depicting the Christ receives the Crown of Thorns was installed in the Chapel of Holy Crown, located on the right of the nave. The painting, looted by French troops in 1797, it is now in the Louvre. This chapel is frescoed with Stories of the Passion by Gaudenzio Ferrari. In the small cloister adjacent to the tribune near the door that leads to the sacristy is a fresco by Bramantino. The church also contained frescoes depicting the Resurrection and Passion by Bernardo Zenale. 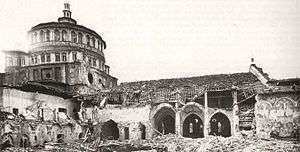 During World War II, on the night of 15 August 1943, an Anglo-American aerial bombardment hit the church and the convent. Much of the refectory was destroyed, but some walls survived, including the one that holds the The Last Supper, which had been sand-bagged in order to protect it. Some preservation works are done to maintain it for the future. It is believed that the current and future preservation works will keep the painting safe for many centuries to come. ↑ Boni, Filippo de' (1852). Biografia degli artisti ovvero dizionario della vita e delle opere dei pittori, degli scultori, degli intagliatori, dei tipografi e dei musici di ogni nazione che fiorirono da'tempi più remoti sino á nostri giorni. Seconda Edizione.. Venice; Googlebooks: Presso Andrea Santini e Figlio. p. 1104.